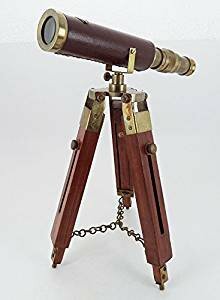 Brass Desk Table Telescope With Adjustable Wooden Tripod Stand This powerful spyglass is made of brass .The focus is adjusted by rotating the threaded section near the eyepiece. The metal Tag reads The length of the spyglass is 8.8" and a magnification of 10x. The Wood tripod stand is 6" high and can be extended to 10" . This is a beautiful hand crafted item. If you have any questions about this product by Ancient nautical decor, contact us by completing and submitting the form below. If you are looking for a specif part number, please include it with your message.